We’ve researched the best places to buy a new mattress in Long Beach, CA. Using our guide along with other online resources should help you to find what you’re looking for. Is good quality sleep important? Researchers think so. Scientists have found that sleep is essential to restore and rejuvenate, to regulate mood, to process information and consolidate memories, to grow muscle, repair tissue, and synthesize hormones. Laypeople recognize the importance of sleep as well: 92% of adults view sleep as crucial to their overall health and wellbeing. Are mattresses important? You bet. In a separate study, 92% of adults agreed that a good mattress is important for a good night’s sleep. If you’ve been sleeping on a low-quality, uncomfortable, or outdated (older than 8 years) mattress, it’s time to consider an upgrade. Shoppers in Long Beach are fortunate to have a wide selection of high-quality and affordable mattresses at their fingertip; the area has a large number of both independent and national chain mattress stores, meaning competitive pricing and good selection. If you’re wondering where to buy a mattress in Long Beach, look no further. We’ve scoured the reviews to bring you the best choices, all grouped by geographic area. Read up and find the best place to buy a mattress in Long Beach, right in your immediate neighborhood. There are a few mattress stores in Northern Long Beach, including both chain and independent mattress shops. Mattress Factory Direct (3400 70th St) has earned great online reviews for its highly competitive pricing, with a good selection of American-made, affordable mattresses. Just a couple of blocks away, Nu-Way (8757 Artesia Blvd) Mattress Corp has both mattresses and furniture, including a wide selection of futons and recliners. The store’s mattress selection includes pillow top, innerspring and pocketed coil mattresses, along with beds and bedroom sets. Further South, Ortho Mattress (4433 Candlewood St) has some of the highest customer ratings in the city of Long Beach. This family-owned, local chain offers factory direct pricing on their own line of comfort mattresses, as well as free delivery, free setup, and free removal of old mattresses. Ortho Mattress sells innerspring, memory foam and hybrid mattresses, and carries both top-comfort and economy lines, making this store an excellent choice for those wishing to compare their options at all price points. There are decidedly few mattress stores in the Southern area of Long Beach, though a few furniture stores in the area do carry select mattresses. Shoppers in Southern Long Beach can visit The Bed Post (3143 E Anaheim St) in the Circle Area. Here, customers can choose between several highly affordable mattresses: Spinal Care, Maxim and Sam, as well as bedroom furniture and sleep accessories. Another well-reviewed option is Caravana Furniture (975 Long Beach Boulevard), which boasts an enviable average 4.6-star Google rating and a perfect 5-star Yelp rating. This reputable, massive, and family-owned home furniture store sells not only modern dining, living, and bedroom furnishings, but mattresses as well, including foam and pillow-top styles. East Long Beach has quite a number of mattress stores, with several clustered in the same area, making for easy comparison shopping. Local chain, Ortho Mattress, has another location in Southeast Long Beach near Belmont Shore (6252 E Pacific Coast Hwy). Just south of Ortho Mattress, Sit n’ Sleep has another location as well (6382 Pacific Coast Hwy). Just a few blocks to the West, in the same immediate area, there’s local chain Orange County Mattress (5700 E 2nd St), which has a total of 14 locations in Orange County. Customers praise this mattress store in online reviews for highly responsive customer service, a painless and convenient shopping experience, and for their fast, same-day delivery. Orange County Mattress carries known mattress brands and economy models like Aireloom, Beautyrest, Golden Mattress, OC Mattress, Serta and Tempur-Pedic. Up in the Northeast part of Long Beach, national chain Ashley HomeStore (7410 Carson Blvd) has a location in the Long Beach Towne Center. The store carries high quality and affordable furniture and mattresses, with gel, innerspring, foam, memory foam, hybrid and wrapped coil mattresses in stock. The store has an incredible 771 Google reviews and an impressive 4.5-star rating. West Long Beach has a few mattress stores to choose from. The appropriately-named Long Beach mattress (2123 W Cowles St) is one locally-owned, smaller option in the Lower Westside. Happy Furniture (449 W Anaheim St) also carries mattresses, along with a wide selection of bedroom furniture and other home goods. Options at this no-frills discount store include affordable mattresses from Crown and Amalfi, with memory foam and coil models. Same-day delivery and layaway are offered, and customer service is well-rated on Yelp. 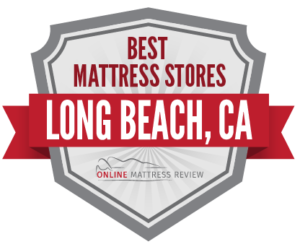 Thanks for checking out our guide to the best mattress stores in Long Beach, California. We wish you the best of luck on your search.